Popa Chubby (Theodore Joseph Horowitz, born 31. March 1960 in New York) is a New York blues singer and guitar player. His angry and aggressive style of blues is influenced heavily by Willie Dixon. Like Jerry Lewis, he is more popular in France than the U.S. Popa Chubby is a true native son of the Big Apple. He was born in the Bronx and grew up in a neighborhood made famous by Robert De Niro in the movie A Bronx Tale. Popa Chubby is a true native son of the Big Apple. He was born in the Bronx and grew up in a neighborhood made famous by Robert De Niro in the movie A Bronx Tale. His parents owned a candy store on the corner of 181st Street and Arthur Avenue. His early memories of hearing the juke box playing the hits of early sixties soul and R&B ? and the neighborhood teens flocking around it ? made a lasting impression on him. To this day the musical influence of Otis Redding, Wilson Pickett, Aretha Franklin and Marvin Gaye are ever present in Popa's music. At the tender age of 8 he picked up the drums and became consumed in playing "Wipeout" (much to the dismay of his mother and neighbors). His parents were huge fans of jazz and R&B and had a vast collection of 78's and LPs. Popa would spend hours scratching them up by playing the sections he liked over and over again. When he was seven, his father took him to see an oldies show at Madison Square Garden. Up close to the stage he watched the headliner duck walk across the stage playing his Gibson 335 like a ringin' a bell!! Chuck Berry became Popa's idol. The untimely death of his father when he was nine left Ted living with his old-school Italian grandparents. His love affair with the drums was put on indefinite hold. The 70's came and Popa began to hear the blues rock that was everywhere. Johnny Winter, Foghat, Led Zeppelin and The Rolling Stones were on the radio and in the record stores and Popa, being a loner, found solace in listening to these records over and over on a beat up record player bought at a yard sale for a dollar. At age fourteen he picked up his first guitar and never put it down. His fingers bled from trying to pick out the blues licks he heard second hand from the rockers who played them. In the late 70's Punk Rock hit the scene, and Popa answered a classified ad in the Village Voice for a guitarist. He was hired by Japanese performance/special effects artist, Screaming Mad George, and played a fortuitous gig at CBGB in New York City's Bowery. There he met Punk Rock godfather, Richard Hell, who was putting together a new version of his band the Voidoids. Popa was hired for a world tour. All the while Popa was honing his licks via the records of Albert King, B.B. King and especially Freddie King. "When I first heard Freddie King my world was turned upside down. I was 19 and this older cat in the neighborhood played me the Just Pickin' record and I was knocked out cold. I thought, ?Man, that's what I wanna be when I grow up.'" With the 1980's upon him, Popa played any and all styles of music he could, the education helping him to survive as a working musician. In 1984, while busking in New York's Central Park, he met singer-songwriter Pierce Turner who had just signed with RCA Records. Pierce and Chubby shared a love for Otis Redding and Jimi Hendrix. 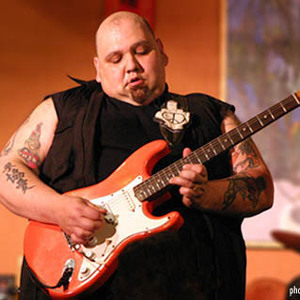 Chubby was hired for a world tour and asked to contribute his blues-inflected guitar playing to Pierce's album The Sky And The Ground. Popa worked with Pierce throughout the late 80's, all the while itching to play the blues he loved. In 1990 the Popa Chubby Band was born. The name was taken from an impromptu jam with Bernie Worell, one of the founding members of ?70s psychedelic rock and R&B group Parliament Funkadelic. "He was singing a song called ?Popa Chubby' and he pointed at me." The name captured the essence of what his music has come to represent. "Popa Chubby basically means to get excited. The core of my music is about excitement. I think music should make people feel alive." Before long he was playing every club in New York. Popa landed the coveted spot as house band at the now defunct Manny's Car Wash. There he got to back up and open for many of the great musicians who came through town. The combined experiences of backing a variety of artists helped shape his vision of what he now calls "New York City Blues." In 1991, he entered the National Blues Talent Search sponsored by Long Beach Radio station KLON. He beat out a score of bands to bring the title to New York City and was rewarded with an opening spot at the 1991 Long Beach Blues Festival. Popa soon started touring regionally and released two independent records on his own label. In 1994 Popa signed a recording deal with the recently resurrected O-Keh label (Sony Music). At first reluctant to sign on with such a corporate outfit, it was the prospect of working with Tom Dowd, longtime Atlantic Records engineer/producer, whose recordings by Aretha Franklin, Ray Charles, Wilson Pickett and others are legendary, that convinced him. Booty and The Beast was released in 1994, and the single, "Sweet Goddess Of Love and Beer," soon was sweeping the country and became a summer radio hit coast to coast in 1995. Creative differences left Popa a free agent in 1996, so he began releasing albums on his own label. On the advice of Dowd he went to Europe, where his first two CDs were released as a collection by the French Dixiefrog label. The record was an instant success and left Popa touring nonstop. The energy and showmanship of his sets earned him critical and commercial acclaim overseas, and in fact, he's become a huge star in Europe, where he appears on the covers of guitar magazines and routinely sells out major venues. The innovative performer and producer went on to do a number of other projects for Dixiefrog, his own albums and others by Big Apple artists recorded under the aegis of Popa Chubby Productions. In the process, he spearheaded a New York City sub-genre of blues. The New York sound is as complex as the city itself, melding a variety of street sounds from hip hop, punk, straight-up rock, R&B, into an unadulterated blues format. "New York is a melting pot of social and musical cultures, and New York City Blues is an amalgam of all those styles," explains Chubby. Popa Chubby's music, forged in the toughness that is New York City, takes blues to the cutting edge, where it highfives its contemporary cousins rock, rap, and hip hop. With his razor sharp, biting guitar, vocals from the gut, and top-notch skill as a songwriter, Popa Chubby artfully combines the rootsiness of blues with the more modern urban elements of today's popular music. In May 2000, Dixiefrog released How'd a White Boy Get the Blues? in Europe, where it has sold over 60,000 records and is still climbing. Looking for a domestic label that would understand his unique approach to the blues, Popa brought the album to Blind Pig Records, which released this seminal blues-rock concept record in August of 2001. It uses electric and acoustic guitar blends, drum loops and electronics to show how close the blues, hip-hop and R&B really are. The New York Post said, "The guitar ace is fantastic on this CD - the quintessence of what New York City blues is all about. There isn't a bad song on it." Popa Chubby's newest CD, Stealing the Devil's Guitar, was released on Dixie Frog Records in February 2006. The 13 songs on this record represent a journey through the real life blues of Popa Chubby. Popa writes from life and from the first track hits a home run with the talking slide blues of "Slide Devil Man Slide". The tone is set and the journey unfolds. Sonically, this record is the most textural to date with lots of slide and acoustic guitar, mandolin, Sitar, and a heavy dose of hard blues rock lead guitar. The urbane rap tome of "Smugglers Game" has Middle Eastern flavors and ejects the listener to exotic border crossings. The heart-rending dirge of "Preacher Man" bemoans the trials of the entrusted. The Western saga "Young Guns" sets the stage for a shootout between new and old- because if you want to take the devil's guitar, you got to steal it!